Hearing is a very important sensory function. It helps us to become aware of our environment and to communicate with others. Although it is possible to hear with only one ear, both ears are needed for optimal function. Sound waves travel through the air untill it is captured and concentrated by the pinna (vissible part of the outer ear). The pinna helps to funnel and modify the sound so that the brain can understand where the sound is coming from. Sound then travels through the outer ear canal untill it reaches the tympanic membrane (ear drum). The sound waves are mecahnical waves and causes vibration of the tympanic membrane. 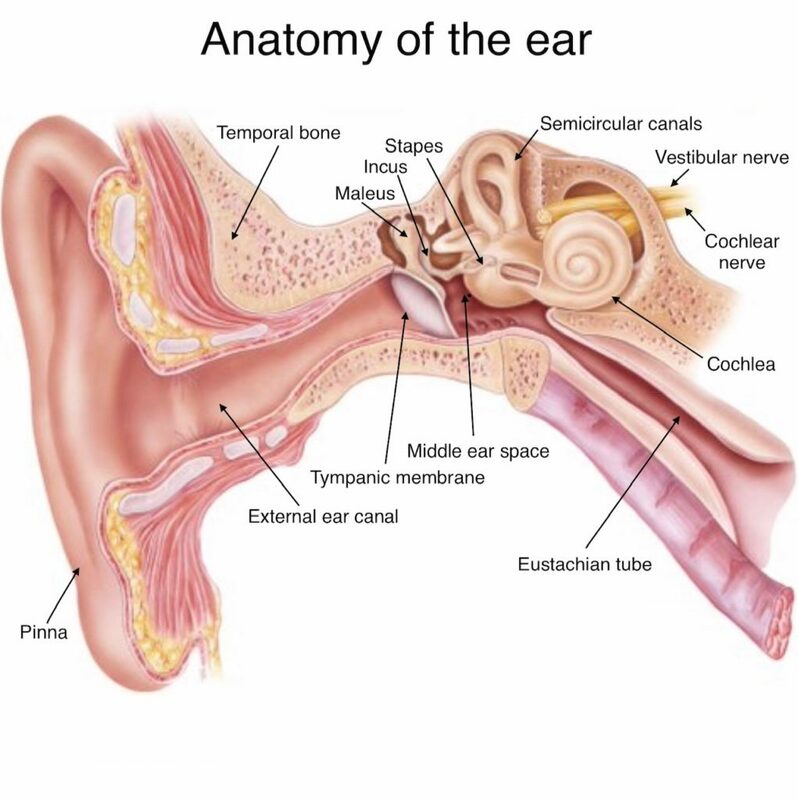 Due to the shape and properties of the tympanic membrane the sound waves are concentrated and transferred to the ossicles (small ear bones) of the middel ear. There are three ossicles namely the maleus(hamer), incus (anvil) and stapes (stirrup). The sound waves travels through the ossicles untill it reaches the inner ear at the point where the stapes resides in the oval window. The pressure of the sound waves causes vibrations in the fluid of the cochlea of the inner ear. Inside the cochlea, special hair cells in the organ of Corti converts the mechanical sound waves into elctrical nerve impulses. Nerve impulses reach the brainstem via the auditory nerve in the inner ear canal. From the brainstem it the nerve impuses passes through several areas untill it reasches the cortex of the brain where the sound is interpreted and processed. Hearing loss occurs when a disruption occurs in one or more parts of the ear or brain that is importand for hearing. There are four types of hearing loss namely, conductive hearing loss, sensori-neural hearing loss, mixed hearing loss and central hearing loss. Conductive hearing loss usually occurs due to a mechanical interverefence in the conduction of sound through the outer and middle ear. Examples of conductive hearing loss include birth defects, ear wax, a perforation in the tympanoic mebrane, fluid in the middle ear, an interruption of the ossicles or a fixed stapes. Sensori-neural hearing loss refers to hearing loss that occurs in the cochlea (sensory) or the auditory nerve (neural). Examples of conditions that impair the convertion of the mechanical sound waves to electrical nerve impulses and the conduction of electrical impulses via the nerve are birth defects trauma, infections, loud noise, vestibular schwannoma and toxins. Mixed hearing loss implies a combination of conductive and sensori-neural hearing loss. Central hearing loss occurs due to damage to the brainstem and brain. Examples of central hearing loss include trauma, tumours and infections. In most cases of hearing loss, the hearing can be improved by means of medication, conventional hearing aids, surgical correction of the conduction system of sound and implantable hearing devices.